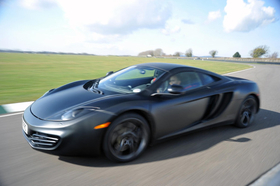 The McLaren 12C, shown, will rival Ferrari's 458 and the Lamborghini Gallardo. WOKING, England (Bloomberg) -- McLaren Group said Europe will provide at least half the buyers for its Ferrari-rivaling MP4-12C supercar as demand for luxury autos rebounds. The 12C, which will cost about 150,000 pounds ($227,000), starts a 50-venue promotional tour in Germany on June 17. About 2,500 expressions of interest have been received for the 1,000 cars to be produced next year, McLaren Automotive Managing Director Antony Sheriff said yesterday in an interview at the company's base in Woking, near London. Britain and Germany will lead European sales, while a further one-third of orders will come from the U.S. and the rest from Asia and the Middle East, the executive said. McLaren, best-known for the most successful Formula One racing team after Ferrari, has selected 35 global dealerships to open in 2011, increasing to at least 70 by 2015 as the model range expands. Sheriff predicts that luxury and sports-car sales will jump about 35 percent this year after slumping during the recession. The 12C will be shown in a private viewing to dealers and registered potential clients in Dusseldorf this week, Zurich and Brussels next week and U.K. buyers in Woking later this month. The car, a rival to Ferrari's 458 and the Lamborghini Gallardo, will make its public debut at the Goodwood Festival of Speed, held at a racing circuit in southern England in July. Jardine Motors Group will run McLaren's London dealership, while Moll Sportwagen in Dusseldorf and Kamps Gruppe in Hamburg will sell the cars in Germany. Neubauer will act as distributer in Paris and Monaco and Fassina Group in Milan. “We feel we're in a very comfortable position already, especially considering we haven't started to market the car yet,” Sheriff said in the interview on a day after McLaren F1 drivers Lewis Hamilton and Jensen Button finished first and second in the Canadian Grand Prix in Montreal. Ferdinand Dudenhoeffer, director of the Center for Automotive Research at the University of Duisburg-Essen, said he wouldn't have expected Europe to lead sales of the new McLaren. In the U.S., the biggest supercar market, sales of autos costing more than $100,000 may jump 42 percent after falling 30 percent in 2009, industry researcher IHS Global Insight says. While performance figures haven't been released, the 12C is likely to have a faster top speed and swifter acceleration than the 458, Sheriff said from an office overlooking two of the Ferrari models and a Porsche 911 used in comparison tests.